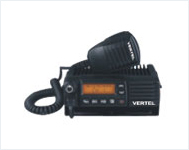 The Vertel VL 007 is all that you can expect from a Base Station/Vehicle Radio. Its expansive list of features and functions leaves nothing out. A sleek design and state-of-the-art operation makes this a perfect radio for various applications.